While Aztec society had rich cultural and artistic traditions, they did not have a written script. Thus information and knowledge was transmitted either through oral means or through drawings such as pictograms and logograms. A lot of these pictograms provide us detailed information about Aztec history and culture. These pictograms were recorded in the pre-Columbian and colonial era Aztec society and continue to be a rich source of information about Aztec culture and history. During the Colonial era, Spaniards introduced the Latin script in the Aztec language Nahuatl and thus the Colonial era codices also contain the written language along with the pictorial sources. Codex Borbonicus is one of the most famous of all Aztec codices and was compiled by Aztec priests around the time of the Spanish conquest. This codex consists of a 14.2 meter long sheet of amatl parchment. Originally, it consisted entirely of pictures but later on Spanish descriptions were added. This codex can be divided into three parts. The first part consists of divinatory calendars with days and paintings of deities. The second part details the 52-year cycle of the Aztecs along with the dates of the first days of all these years. The third section discusses various Aztec rituals and ceremonies. Codex Mendoza was created during the early colonial era in 1541 for Spanish king and Holy Roman Emperor Charles V. It consists of four sections with the first one dealing with the history of the Aztec people starting from 1325 when the city-state of Tenochtitlan was founded. Section two details the city-states and tribes conquered by the triple alliance of Tenochtitlan and the tributes paid by each conquered city-state. Section three is about the daily life and culture of the Aztecs. Finally, section four is about the economic transactions and assets of Spain in the new colony. Perhaps the most important Aztec codex which details Aztec life before the Spanish conquest is the Florentine Codex. This codex is a set of 12 books and was compiled under the supervision of the famous Franciscan friar, Bernardino de Sahagún, between 1540 and 1585. It was a copy of the original Aztec source materials which were destroyed during the Spanish conquest. This codex is considered the comprehensive source of Aztec life and society before the Spanish conquest. A complete copy of this codex was published in 1979 and only censored and rewritten versions were available before that. Codex Osuma is a set of seven separate documents created in 1565. These documents consist of evidence against the government of Viceroy Luis de Velasco during the 1563-66 inquiry by Jerónimo de Valderrama. It details the accounts and complaints of the indigenous people about non-payment for their goods and services such as construction work and domestic help. 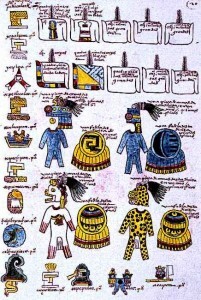 The original codex was solely pictorial in nature but later Nahuatl descriptions and details were added which were then translated into Spanish by the authorities. The codex itself was named after a Spanish nobleman called Mariano Tellez Grion y Beufort, the twelfth duke of Osuna whose library had this codex. Among the Aztec codices which deal with the history of the Aztecs, Codex Aubin is quite important. This particular codex is also in pictorial form and details the history of the Aztecs since migration from Aztlan through Spanish conquest and also the early colonial era, until 1607. This codex consists of 81 leaves and was possibly compiled in 1576, supervised by Fray Diego Durán. However, the details about the year of compilation and writer are disputed. Some scholars have called it an authentic account of the Aztecs based on oral sources. Religion was of supreme importance in the Aztec empire and various Aztec codices dealt with religious rituals and ceremonies. One such Aztec codex is the Codex Magliabechiano which was compiled during the early colonial era in the mid-16th century. In total, it consists of 92 pages which entirely deal with religious and cosmological elements. Various things that are dealt in this codex include the Aztec sacred calendar, religious rites of the Aztecs, ceremonies, various deities, costumes, and cosmological beliefs. Like most Aztec codices, this one is also based on an earlier Aztec codex. Spanish text is included in this codex along with the pictographs. Among the Aztec codices written before the Spanish conquest, Codex Borgia is of particular importance. It is thought to have been compiled in the area of present-day southern and western Puebla. It is made of animal skins folded into 39 sheets. In the name, this codex is a ritual and divinatory manuscript and also features a long astronomical narrative. 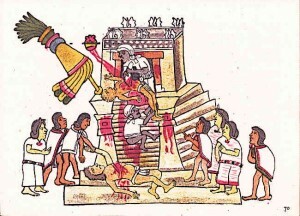 Various Aztec gods are also depicted in this codex along with their powers and rituals including the human sacrifice. Other important matters discussed in this codex include Aztec marriage, day signs, and others. The codex was named after Italian Cardinal Stefano Borgia who was the owner of this codex before it was acquired by the Vatican. 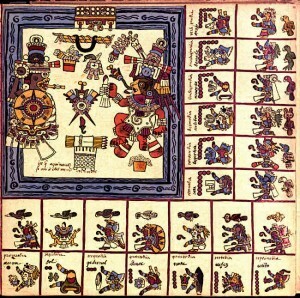 Codex Xolotl is among the historical Aztec codices and depicts the history of the Valley of Mexico, in particular the sister city of Tenochtitlan, Texcoco. The history in the codex starts from arrival of the Chichimeca under the king Xolotl in 1224 and continues to the Tepanec War in 1427 after which the Aztec Empire was established. It is composed of six amatl boards measuring 42 by 48 centimeters. The name of the creator of this manuscript is not known. It is considered an important document about information on Aztec history, culture, and politics. Before the Spaniards arrived in Aztec Empire, the Aztecs did not have a written script and their communication was based on pictorial representations which were preserved in various Aztec codices. Based on this material and oral traditions, a variety of further Aztec codices were compiled during the colonial era. These Aztec codices are an invaluable source of information about the Aztec people and their art, culture, history, religion, and politics.